I know, I know..."How do I get experience when no one will give a trucking job where I can get the driving experience!?!" It's frustrating, but you are not alone. A lot of CDL holders are going through the same cycle. So what does that mean....well that means you have to shine more than them to get the spots that's available! This will help, find out what makes a good truck driver so that you know exactly what type of driver is needed by every company then come back here. Now that you have learned what a trucking company needs and wants, be sure to let it come across when your are interviewed or to get the interview. Put it somewhere on applications that you fill out when it asks if you have further comments how your values line up with the company's or how you can take pride in working them based on how they were started, etc. Never leave the comments section blank on any application trucking or otherwise. Always take advantage of it to let the positive side of you shine and to thank them for considering you. That alone will put you ahead of some of your peers trying to get the job. Also, don't neglect Craigslist.org. Many smaller local companies are there. Be persistent in applying to jobs. Call back after a certain amount of time. Sometimes timing is everything. Also research a little background information about the company before you go in to an interview so you can reference something about the company if you are asked why you want to go to work at that company. All you have to do is put the company name in google like this....."How company x y z got started" or "history of x y trucking company" and you will find likely find a story. It might also be listed on the company website "about" tab. Many good company hiring personnel will ask, "why do you want to work for our company" or "tell us why we should hire your". Some to get a genuine idea of your interest, others to get a feel for your ability to think, or see how you think. If you want to blow them away have a response that shows you actually know about the company and chose that company for a specific reason which relates to the company's history and/or your needs. Better yet, how the current company's mission (and operations) and your needs are in alignment with each other. Ok. I know, for many of you this doesn't represent reality. You don't really care about the company specifically. You just want a job. If you are desperate, I understand. It gets that way some times. Do it any way, it's fun and worth the time. Here is the thing. You SHOULD care about the company you work for. The company should absolutely operate in a way that is in line with your philosophy. When you find a company came about by people who share values that you can identify with, you would be proud to work for that company if those values are still there. Also, they are likely to treat you the way you want to be treated. Of course, the way the company currently operates must also be in line with your needs. Example. A driver had a great relationship with his wife who was pregnant. He wanted to go home to be with his pregnant wife who was having complications. After 2 weeks of broken promises, the company still didn't route him home. He goes anyway. Of course he gets fired. He buys a truck and leases on with a friend. Saves his money. Decides to start his own trucking company based on the values that he believe are important to have for drivers and customers. He treats his drivers the way he wants to be treated. Doesn't lie to them and considers they are humans not machines. There are trucking companies that started in similar ways. You just have to find them. Others came about out of necessity or as a division of another company, upon further investigation the other company was shabby and had a bad rep so the new company was formed by a driver to better serve the customers. Can you see how these 2 companies might treat the driver differently. Now, if you applied to one of these types of companies and at the interview you show that you are aware of how they came into existence and that is why you feel they are the right match, can you see how they are more impressed with you than other candidates who are simply looking for a job? Now you might have another company who seems to focus not on values or the culture but the efficiency for the customer. If that company is somewhere that you want to work, you would highlight your attention to detail, ability to plan, why you are dependable, etc. More so than your personal values and commitment to family. See how this works? Don't lie but show you are in tune with the company. These are little things in itself. Each little thing that you do right adds up in your favor. Don't take them for granted. Nail the little things, especially if you need to make up for other things like a less than perfect driving or criminal record. Continue reading about how to get truck driving job experience as a newbie. Remember: You need to stand out from the others who are also seeking employment. Some ideas will follow. New Drivers or CDL Training School Grads For new CDL holders, getting a trucking job can be tough because a lot of companies want a year of experience but you can't get experience because no one will give you a trucking job right!?! It's enough for a serious headache! Don't worry it will past. (the headache I mean! LOL) First calm down and relax and stay positive, it's not a personal attack on you. First - go to get business cards with your name and contact information on it. Later you will use these cards to pass out to everyone you meet. Especially those working where there is a lot of trucking going on but other people you meet also. This includes everyone from trucking companies to other drivers and owner operators and even shipper or receivers in warehouses or managers who work at large manufacturers. After you order your cards. Create a resume. Yes, a resume. Most drivers will not have one to get a trucking job. That alone helps you to stand out when you apply for a trucking job. Maybe you can leave it with your application. They will look at that before looking at the application and then look at your application first. Then do a cover letter. Yes a cover letter for a trucking job. Make multiple copies and also have a digital copy on your computer. Second - go to one of these trucking sites that will allow you to fill out one application for many trucking companies. You will find a few of those on the truckers resource page. This works for some applicants and not for some others because everything matters to make the best matches for you and the company. Your location, driving record, criminal record, endorsements, job history, military experience, volunteer work, (who knows what else a company prefer or for what reason, maybe in some area you will be exactly what a company is looking for but maybe not. Also, many drivers fill these things out. It is not the necessarily the best way to get a trucking job. The internet of course makes it easy to pick out a driver from all those applications that may suit their needs or desire so it's worth the time to use these databases as long as it's free. You DO NOT want to sit back and wait for one of the trucking companies from that one application to call you. Remember, there are a lot of drivers filling those out, that's just one step in the process. Third - Go to the nearest truck stop to you and get some trucking magazines with the companies listed so you have a lot of trucking companies in one place on paper(If you find yourself waiting somewhere conducting business you can conveniently look through the magazine. This would be more difficult to do with a laptop online). You are saying, "Why do I need to do this, won't they call me from the application I just filled out if they want me?" No, not all trucking companies use those services. Many of those listed in these magazines will not use the service you just filled out that one application for. Some of those services cost the trucking company and some trucking companies prefer to just do things different ways. Plus, it's kind of cool for you to use the trucking magazine because you will see maps illustrating where the company is hiring and where the company runs (it's operating lanes, and hiring lanes too). This gives you a real good idea of who to call first. You ideally want a job at a trucking company near where you live or whose operating lane goes through where you live. This makes it likely that you will get home more frequently. But of course, if you are trying to get experience then you shouldn't be too picky until you get a year under your belt. You have to be flexible and yes that means you will not get home as much if you end up at a company where there is no terminal near you or where you live is not near their lanes of operation. This is how trucking works, and it is why trucking is not for everyone. You have to look at the situation before you. If you can't change it or live with it, it is not for you. Fourth - You want to pay attention to the manufacturers and/or distribution centers in your area with company trucks that haul their products over the road. Stop in and speak to their human resources to see if they are hiring. Take your business cards. If you meet people on your way in who works there, greet them with a smile, tell them you hope to be working with them someday and pass them a card. (I know this is not usual, dont worry about that, we are going to do this my way, what good is it to do what everyone else does? Now, many of those companies in the trucking jobs magazines will want experience but not all of them. Plus you never know who you might run into while you are at the truckstop getting the magazine that could help you. Talk to the drivers or even the head mechanic. Ask if the know any owner op local company that is hiring. Let your good positive attitude and smiling face shine and impress everyone you talk to starting from the receptionist. If you came up from the streets where you were taught that smiling was a sign of being soft, you need to realize that you are not on the street (block) and trying to be (look) hard is likely to work against you when trying to connect with people. Why would they want to work beside you or even hire you to drive the truck and meet their customers giving off that vibe? You want to show through you appearance (including facial and bodily expressions) and attitude that you are easy to get along with and not a threat to a peaceful and productive work environment. You also want to show through your dress a certain level of maturity. This means no saggin pants with your draws showing. You might say they shouldn't judge. Well guess what all people judge. You might say what does your saggin pants have to do with you wanting to work. What if you are asked, "Why do you wear your pants like that?" What will be your intelligent reason? Attitude, appearance and personality matters. Tell them you will work for free for 2 weeks training at that job with the person they already have and after the two weeks they can decide if you are someone that they can use and put on the payroll. This shows confidence in your ability and performance AND a desire to work. You never know what their response will be until you ask. At that point they either need to decide if they will began to pay while your getting more productive or they can let you move on. This is just a thought but a powerful one. Thinking outside of the box is what creates opportunity for people. It has a the advantage of less competition than doing what everyone else does or doing things the way they have always been done just because it is the way it has always been done. Often it also allows you to express certain characteristics that a person would otherwise know about you. So if this gets you in the door, always be on time, ask questions to understand your tasks and never goof off on the clock. Fifth - Sign up for self improvement classes that may be free or cheap as continuing ed courses at community colleges or Small Business Centers. Also ask people at the education center if there are classes given for people in the transportation industry or for personnel management, time management, communication, etc. These are classes that will not only better you as a person which will only add to the value you could bring to a company willing to give you a chance, but you never know who you will meet in these classes. Remember your business cards? Mingle and hold conversations with fellow students at breaks and after class (please not during class), find out who they are and what they do. Tell them about your ambitions to start your career in trucking. Let them know about the wall you have hit and how anxious you are to get started but how aware you are of the need to have patience and be persistent. How you know you will make someone a great driver because you know what is important to the job and the needs of the company. From these conversations if you indeed are the person that I hope you are or are becoming, if there is someone there that can help you get a job or introduce you to someone who can, trust me they will. Most people like to help people, once you show that you are good people and that you are trying to better your life. Especially if you seem like you would make an employer a great employee your card will be passed on automatically because the person passing it will be impressed by who you are. You have showed them that you deserve to be given a chance to shine! Also see if there are Career Readiness Classes available at your local community college. These train/test you for work skills and gives you a certificate indicating a level of proficiency. It puts you ahead of other job seekers who does not have a proof of competency or skills set. Now I think you have some tools at your disposal to try and get yourself some good trucking experience as a new CDL holder. Be patient, keep your head up and stay at it. If you haven't read this page about being a good truck driver by now you should she that you should so go read it. You may also submit your name and contact information below so that visitors who may need drivers can contact you from this site if you want. 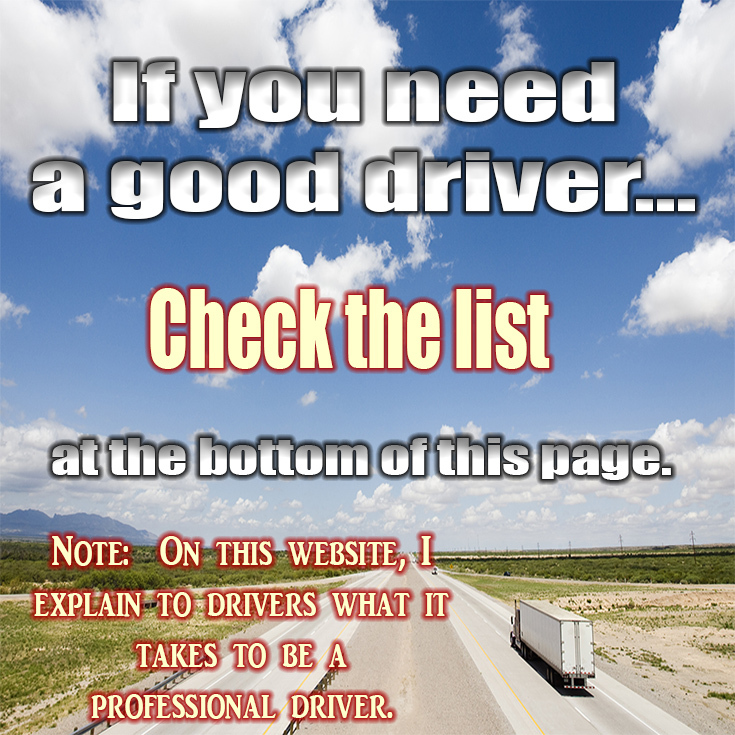 If you are a new driver needing a trucking job feel free to list your contact info below. Hiring Companies or Owner Operators remember two things. 1. You were once inexperienced and the fact that your are now in the position to hire means that you have excelled. 2. These drivers that are here on this site have read a lot of positive and insightful information which gives them the advantage of wanting to began their trucking career the right way. The potential that these guys will make you good drivers is high. Give us the details of what you desire. what are your needs and what are you willing to work with. Your submission will appear on a Web page exactly the way you enter it here. You can wrap a word in square brackets to make it appear bold. For example [my story] would show as trucking job requires on the Web page containing your requirement. Seeking class a local routes in or near Albuquerque new mexico. No experience. Need help finding a job to fulfill my dream as a trucker I'm in Stockton California 95207 got my license A and ready to hit the road. CDL Grad looking to drive!! Two DWIs from over 10 years ago plus Marijuana poss from 2yr ago will a trucking company hire? Will I get trucking job with a 2008 DUI? In Illinois, how long is the training for a new graduate of a cdl class a school, once a company hires them as a student driver? Looking for truck driver training near The Willamette Valley. I just got my CDL, i am looking for a job. is there a difference in cost of cdl depending on state? NYS Class A Driver looking for trucking job. Class B Construction Hauling Exp. IN DriverTimothy Miller with 10 years lcoal semi experience that ended in 1999. Ready for the road again. Jim Kelly 15yrs exp just not recent. tanker endorsement. Houston driver, looking for a driving job. 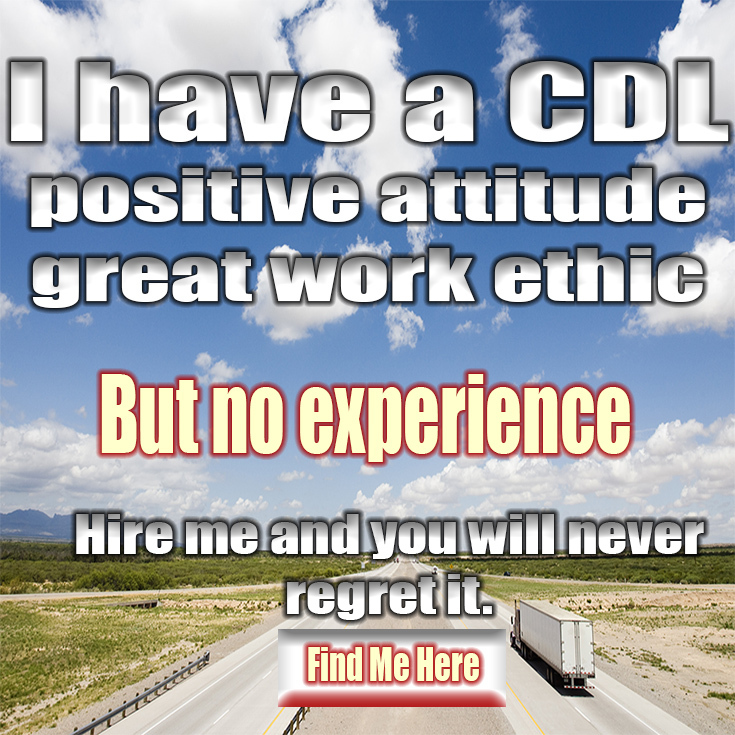 I'm seeking a sponsorship with CDL Class A within my area and a career to start, relatively. I'm offering to be a dedicated good driver. I am looking for a job , cdl class A .. I have a cdl-a,with tanker. call me @ 918-537-4051 cell .thanks.diving since 2000. I have done cat. C in 1986 since that I was not driving lories, and financial situation not eloping to pay for it. I just want to drive..no experience..no obligations.I'm free to go anywhere u need me to drive...I'm ready. I need to learn to drive a standard trans I already my Cdl, I can drive a standard auto just have not driven a manual big truck. I'm seeking to become a truck driver,I have my c,d,l,just need a chance. I have a valid Arkansas CDL, I am seeking a job driving with a company that allows student drivers all ready holding a class A CDL. I can offer a focus student driver that's change my life and looking for a second chance. Work with trucking company with good payment and go to the road fast. I have a hazmat and a tanker Endorsement from driving bobtails propane trucks. But with class A I really would like to get experience in 18 wheelers. im seeking to get experience on hgv class 1. to get easily job. im a recent graduate 4-18-2012. I have a class A CDL with hazmat endorsement. B U T I'm also a convicted felon. It occured 6yrs ago. 25years Driller/Derrickhand experience with new class-A-C.D.L.and current D.O.T.physical. Seeking oilfield job. i am seeking information about California trucking jobs. i am looking a company ho can give me training because i am not very fast in my backing. I am seeking a job am 19 years of age with a Class A cdl silence am looking to work. i have had experience because I use to work for Iglesias Corp. I'm a very dependable driver. I just for my cdl and I'm trying to start my career n do something I have always dreamed of doing. I offer dedication, loyalty, and willingness to be the best. I am seeking an opportunity to be an OTR trucker. well i have a class a cdl/with no exp.